Tymon Mellor: Following the liberation of Hong Kong from the Japanese in 1945 the KCRC was operated by British Military Administration before its return to civilian control. Within a few months the line was operational and regular services re-commenced. As Hong Kong grew, so did the railway patronage, pushing the railway to the limits of the capacity of the single track line. 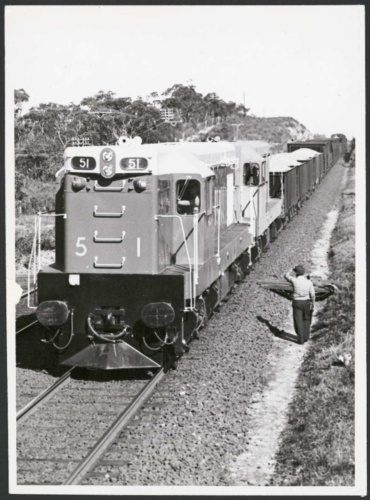 This report covers the post war period up to the start of the double tracking works in 1978. 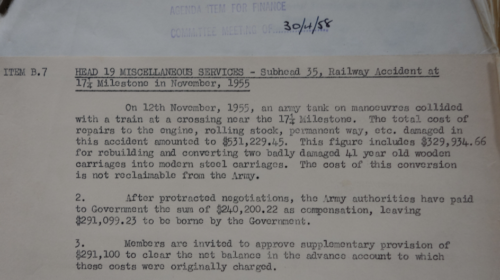 During the Second World War, the occupying Japanese forces ran the railway (details of service are documented here). 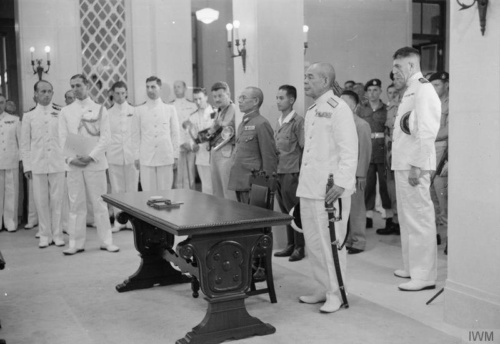 Following the announcement of the Japanese surrender on the 15th August, 1945, and the liberation of Hong Kong to the British Royal Navy on the 30th August, 1945, a formal surrender was undertaken by Major General Unekichi Okada and Vice Admiral Uitaaro Fujita at Government House on the 16th September, 1945. 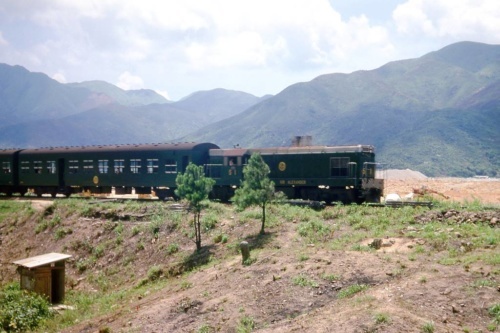 Work commenced immediately on the restoration of the Kowloon Canton Railway- British Section. With the liberation of Hong Kong, members of the Royal Navy, notably Lieut P Morris and Sub Lieut R Spurway of HMS Indomitable started to plan for the restoration of railway services. With the technical support from the Royal Air Force, a refurbishment programme was undertaken on the rolling stock found within Hong Kong. By the 29th September, 1945, a locomotive and carriages were ready to re-commence passenger services. The first train to left Kowloon under the command of Wing Commander R Morter, possibly one of the few time the RAF has piloted a steam powered vehicle. The train journey was recorded on film by the RAF and is held by the Imperial War Museum. 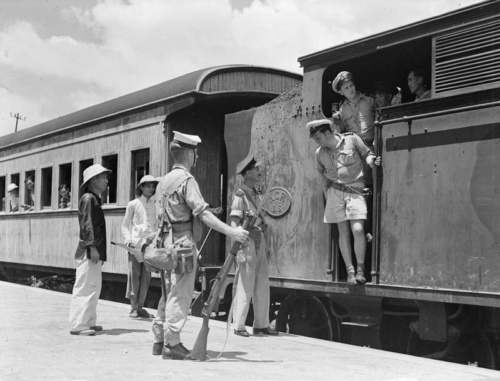 The railway remained in military operation until the return to civilian administration on the 1st May, 1946. 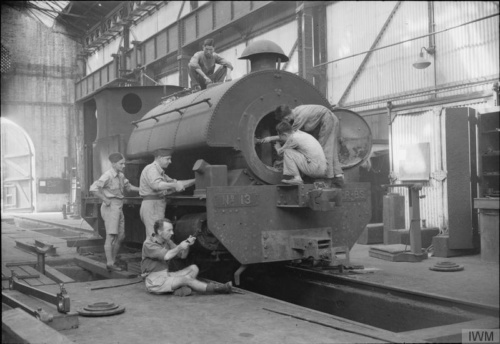 During the war, the Japanese had undertaken only temporary repairs to the line and tunnels, raided the workshops of equipment, emptied the stores and paid no attention to railway maintenance. Five miles of track was found to be missing, mostly taken from sidings and station loop lines, and the rolling stock was scattered over the Canton-Hankow railway network. 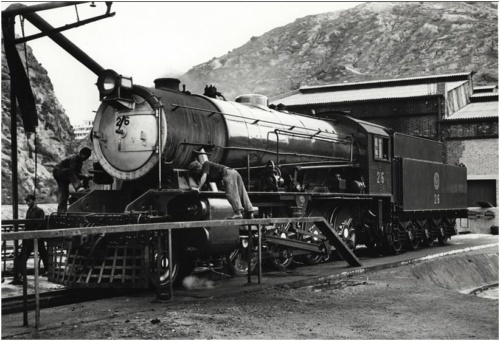 The only rolling stock found in Kowloon was one of the Kitson 4-6-4 tank wagon, one Canton-Hankow Railway 0-8-0 tender locomotive, and 17 carriages and 82 wagons both British and Chinese. The Chinese rolling stock was returned and by 1946 the Canton-Hankow Railway returned one 4-6-4 Kitson main line engine, one shunting locomotive, and the British Section 66-ton locomotive break-down crane. 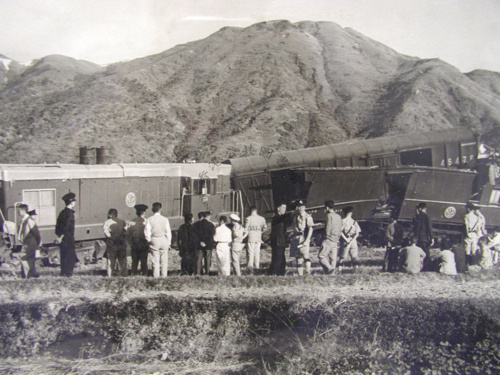 In addition, two 2-8-2 locomotives, supplied by the United Nations Relief and Rehabilitation Administration (UNRRA) out of a total of six which arrived in the Colony were specially assigned to the British Section by UNRRA for the purposes of moving UNRRA/CNRRA (Chinese National Relief and Rehabilitation Administration) supplies to Canton for the interior. By 1948, twelve new Austerity 2-8-0 locomotives with water tender were received. These trains were built for war services and “were not of modern design”. They would be the work horse for the following few years but they required extensive heavy maintenance to keep them in an operational condition. The former Canton Belle and Taipo Belle motor coaches had been cannibalised by the Japanese for parts and new spares were no longer available from the manufacturers. The cars were converted to first and second class carriages. The Bedford rail bus survived the war and was put back into service along with a new motor rail bus built in the Kowloon workshop from two Dodge motor truck chassis. 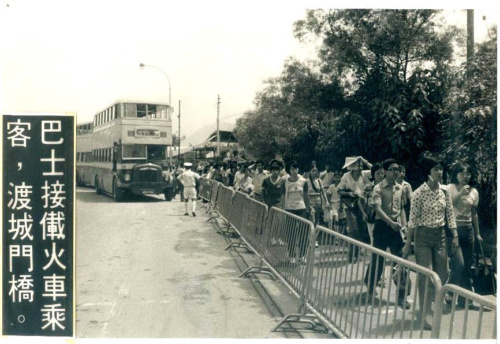 Both vehicles provided a shuttle service within the New Territories and operated into the early 1960’s when they were withdrawn from service. By 1953 it was clear that the steam locomotives were no longer economical to operate and the growth in traffic would force a conversion to diesel electric locomotives. In August 1955 two General Motors diesel electric locomotives named Sir Alexander and Lady Maurine were purchased from Australia. All the maintenance teams and drivers had to undergo training for the new vehicles. Over the following ten years a total of 8 diesel electric locomotives were purchased and by 1958 the steam trains were only providing service during festivals. The final steam engine was withdrawn from service on the 2nd September, 1962 and sold for scrap the following year. 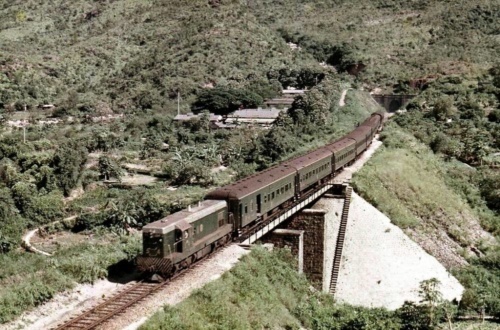 In May, 1946 the line was operating 8 trains a day between Kowloon and Shum Chun, including four through trains in each direction to Canton. With addition of new rolling stock and the rail bus services, the daily passenger service increased to meet the growing demand. In 1947 the line operated 24 trains per day, by 1951 this had increased to 32, 36 by 1975 and 44 train per day by 1977. The latter comprised 22 trains in each direction with a 30min service during the morning and evening peak hour. Given the single track nature of the line, this was a considerable achievement to maintain with only a rudimentary signalling system. Cross border patronage was impacted by civil disturbances in the Mainland, particularly in the early 1950s. 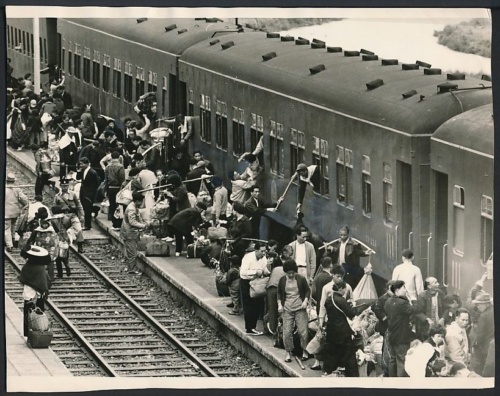 Restrictions on travel and the introduction of border controls by the Mainland authorities on the 15th February, 1951 had a major impact on patronage with passenger demand dropping 12,000 passengers a day. 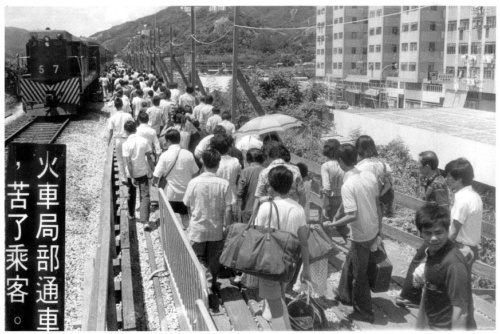 In 1968 disturbances in the Mainland again spilled over into Hong Kong and as before impacted the railway. There were brief disruptions to the service when bombs were found on railway property. Altogether 38 bombs were planted, of which 9 were real and 29 simulated. 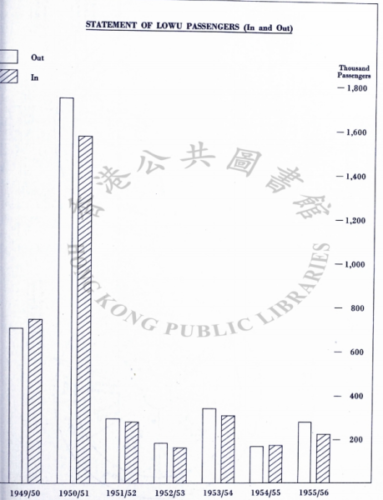 However, with the population of Hong Kong growing and the easing of border controls from 1953 onwards, patronage grew once more and passenger over-crowding become a problem. By the mid-1970s passengers were using train windows to gain access and injuries were not uncommon. The railway needed to expand from the single train operation. 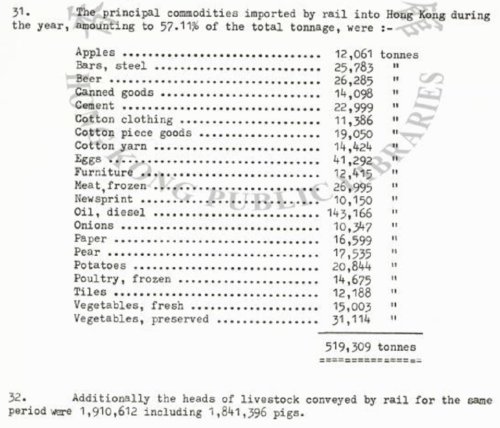 In addition to the patronage of trains, daily freight trains were operating bringing goods from the Mainland into Hong Kong. Despite all the problems in the former these goods trains had limited disruption. By the late 1950s there were five goods trains a day in each direction and by the late 1970 this had grown to 20 trains a day. 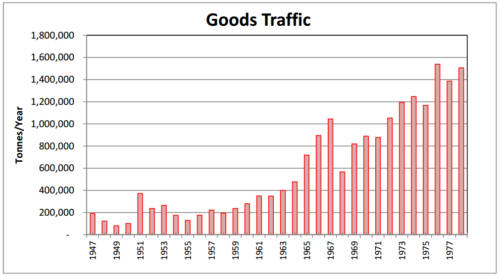 Imports from China represented 99.9% of the freight carried in 1978, the export market was minimal. 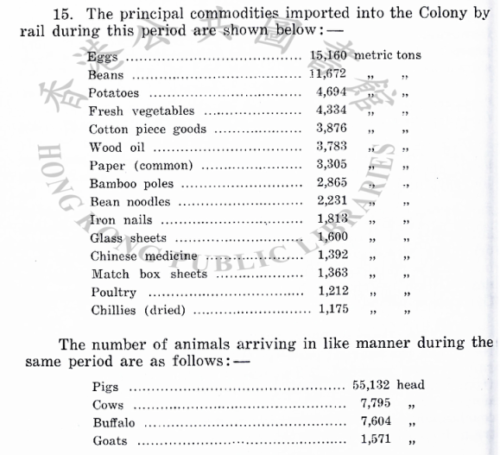 In addition to imports, the railway transported goods within Hong Kong. 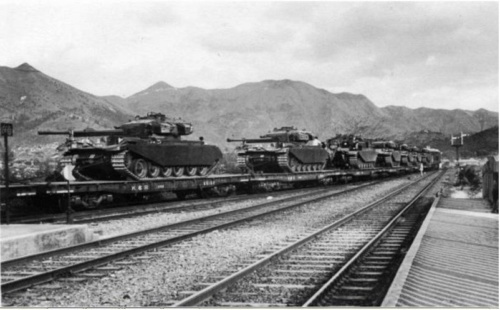 In July and August of 1959, 51 Centurion Tanks were moved from the Hongkong & Whampoa Docks to Fan Ling for the military authorities. 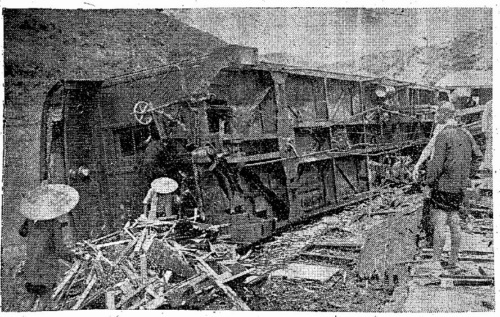 Most of the war damage to the railway was caused by the British attempting to disable the line ahead of the Japanese advance. 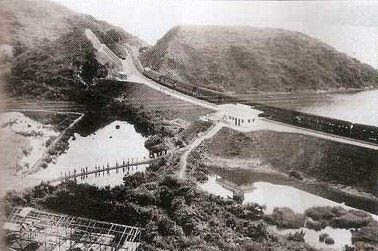 The Japanese undertook temporary repairs, including the use of wooden props to secure the roof of the Beacon Hill and Tai Po tunnel. With the re-occupation of Hong Kong, an 18 month rehabilitation programme was implemented. Working at night, 800m of the lining in Beacon Hill tunnel and 30m in Tai Po tunnel were repaired, and despite two large rock falls the works were complete by August, 1947. 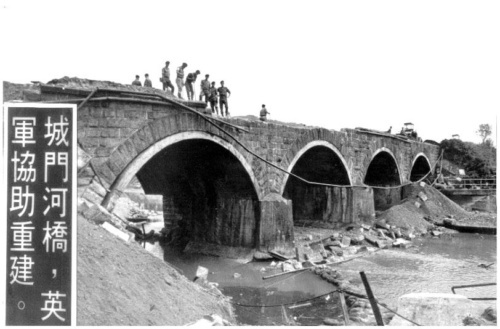 Bridges 25, 33 and one pier of Bridge 47 were also demolished by the retreating British forces and hastily re-built by the Japanese. 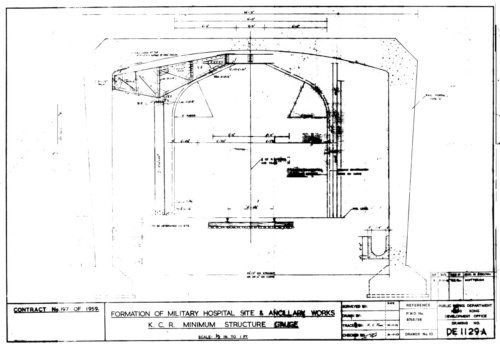 Again these needed to be re-built to ensure their integrity and the work was complete by November, 1946. As reported in the 1948 Annual Report; “The total cost of the repairs which were necessary owing to damage caused by military demolitions in December, 1941 was $701,356.” You can almost see them trying to send the bill to someone! On the 15th October 1949 the Wo Hop Shek branch line was opened. Construction of Wo Hop Shek station had commenced in 1941 but was suspended by the war. The tracks had been removed by the Japanese and 366m had to be relayed. Details of the line can be found here. The station at Ma Liu Shui opened on the 24th September 1956, to serve the local residents and Chung Chi College being constructed to the west of the station. The station was complete in August, 1955 but was unable to operate due to a delay in the supply of the new signalling equipment. 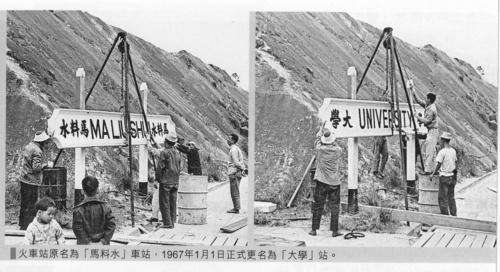 By 1966, there was concern that the name of the station, Ma Liu Shui “did not sound well in Chinese” and on the 1st January, 1967 the station was renamed University Station in recognition of the recent establishment of the Chinese University in 1963. 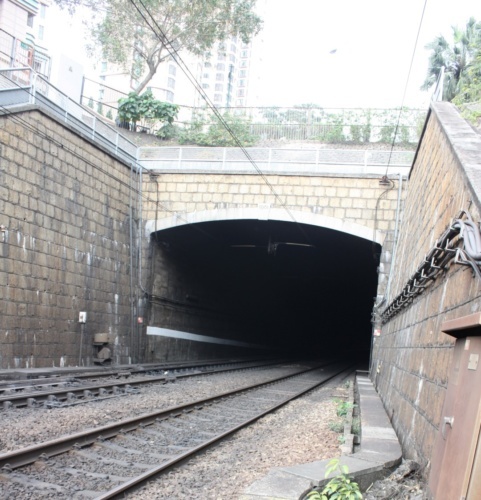 To the north of the current Hung Hom station the railway enters a 286m long tunnel, Tunnel 1A to allow Princess Margaret Road to pass above. The tunnel works commenced in 1962 and were completed in 1964 as part of the Nairn Road extension (to be renamed Princess Margaret Road in 1966 to commemorate the royal visit). The road also provided vehicular access to the new British Military Hospital under construction at Kings Park (now the Parc Palais development). Construction of the tunnel followed the existing railway alignment along cutting number 1. 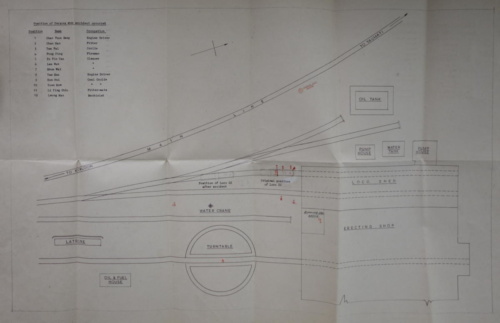 A steel shutter was erected over the line and a 15 mile/hour speed limit imposed to allow the tunnel to be constructed around the operating railway. Yau Ma Tei Station was renamed Mong Kok Station on the 31st December, 1968 with a simple ceremony attended by leading members of the Mong Kok district and Government officials. 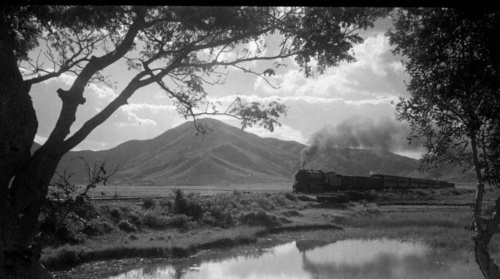 On the afternoon of the 3rd September, 1948, the express train from Canton de-railed between the stations of Pu Kut and Li Long 14.5km north of Shum Chun, modern day Buji in north Shenzhen. 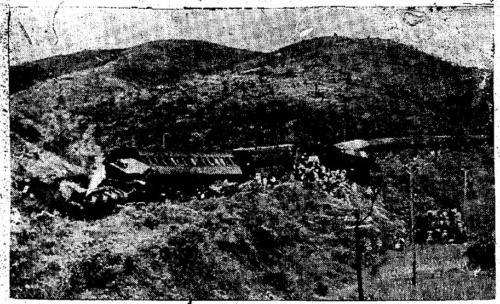 The locomotive and the first six coaches left the rails on the curve, killing around 100 passengers and injuring many more. The impact of the crash resulted in the fourth carriage mounting the third car, smashing the car body and all inside. The British section provided assistance and put on a special relief train to return 94 injured passengers. No official report was prepared on the incident but it was reported at the time that sabotage was suspected. An examination of the disaster scene revealed that “Several clamps, locking the steel rail together, were found separated from the rails nearest the point where engine left the track. The rivets were also missing, indicating that the clamps were disconnected purposely”. The section of line passed through an area of known bandits and clashes with Mainland troops had occurred on several occasions. Sabotage of the line was no surprise. 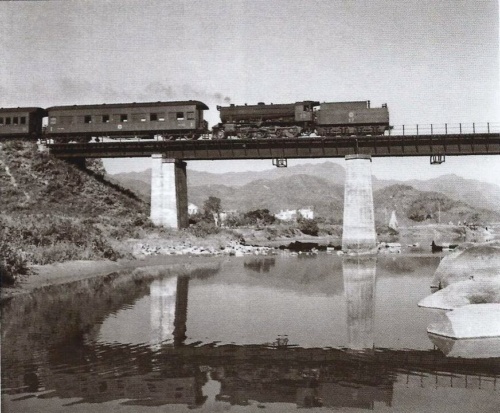 In December 1952, a locomotive had hit a military gun carriage towing a gun on a track crossing at Mile 17¼, the current location of the Kau Lung Hang footbridge. All seven passengers of the military vehicle were thrown out into a field and sustained injuries. 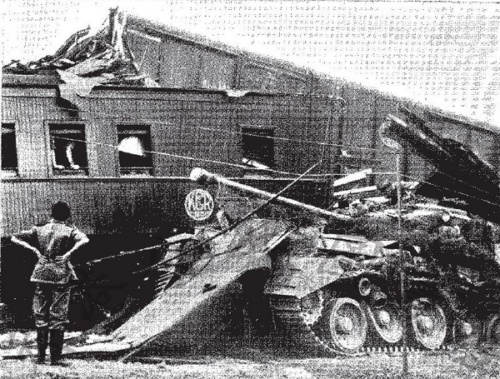 On Saturday the 12th November, 1955 at 3pm a passenger train collided with a military “Comet” tank, at the same crossing. The tank had been taking part in a large five day exercise when the commander failed to prevent it from crossing in front of the oncoming train and was later charged with manslaughter. The locomotive went over the tank and took it some 100 meters before coming to a stop. 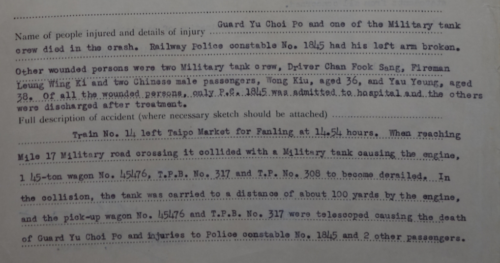 A railway guard was killed along with a member of the tank crew. The new diesel locomotive Sir Alexander was damaged but back in service in two months, the tank was a write off along with a number of coaches. 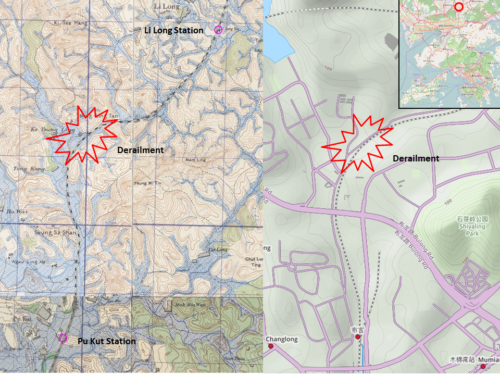 The tank commander claimed the tank had run-away down the steep road, thus immediate steps were taken to revise the road layout to prevent a similar incident in future. Financial settlement of the incident took until April, 1958 to resolve. At 3:30pm on the 27th April 1956, there was a locomotive boiler explosion killing six members of staff with scalding steam. The locomotive, an Austerity 2-8-0 type steam locomotive was supplied at the end of the war and had been a constant source of trouble. The remaining units were examined in detail, faults were identified requiring six locomotives to be withdrawn form service and two boilers completely reconstructed. The incident resulted in accelerating the conversion to diesel electric traction and additional orders for three more diesel locomotives were made on the 1st June, 1956. By the end of 1965, two diesel locomotives were being used for passenger services and steam locomotives were limited to freight trains and festivals. 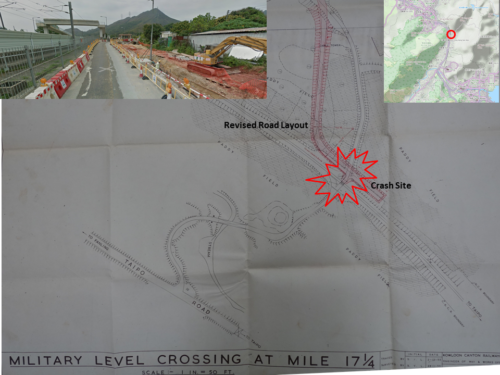 On 24th August, 1976,Tropical Storm Allen hit Hong Kong; by the morning of August 25 the upper reaches of Shing Mun Reservoir overflowed and undermined the foundation to the railway bridge crossing the Shing Mun River. Passing railway workers noticed the problem and immediately advised their superiors and the bridge was closed. The bridge had to be demolished and rebuilt so during this period, a bus shuttle service operated by the China Bus Company, provided a temporary replacement service. Trains from Hung Hom stopped at a new temporary station at Tai Wai that had been built in 48 hours and 12,500 passengers each day were transported by bus to continue their journey from Sha Tin Station. Freight transport and animals were transferred to Wo Hop Shek station; vegetables and eggs transferred at Fanling Station, other trucks respectively transferred Ho Tung Lau Depot or Tai Po Kau Station. Given the importance of the line for the import of food to the Colony, the authorities were extremely concerned about the situation and with the assistance of the British garrison, the bridge was re-built within 40 days with the rail service resuming on the 11th October 1976. By the early 1970s it was clear that the line was reaching capacity and something would need to be done. 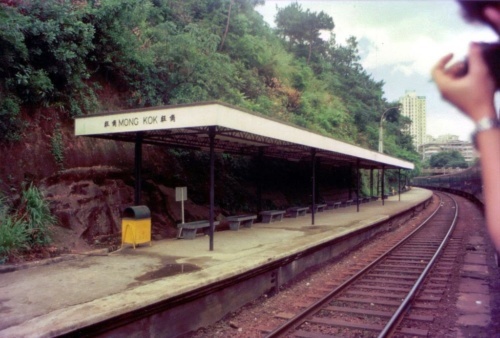 A new terminus was constructed at Hung Hom, opening on 24th November, 1975 and double tracking along with electrification of the line was completed on the 15th July, 1983. This article was first posted on 9th June 2016. What was the final disposition of the two Hall-Scott Motor coaches, the Taipo Belle and the Canton Belle, Did they possibly survive the ravages of World War Two?